Shhhhhh!!! - Plan 'Bigsi' area! By Bibs, February 13, 2007 in Shhhhhh!!! - Plan 'Bigsi' area! Do we have a game plan yet as to what parts and work is required to get Simon's slonker G-Car back on the road? Troy, I'm guessing that's down to you? Is it worth starting a new thread to gather techy and logistics information all in one place and leave this one for more general messages? That's a cracking idea as it goes and when they are out we can sneakily steal his car, place some bricks under the tarp and he'll not know it's even gone! Oh, I've just installed some new smilies! I am up for the hoon and/ or car build and or beer and sandwiches or any combination therof. If we can get enough esprit versions and give Si a ride out in each that will be top banana. So we will have a NMEG convoy heading for the Valley's. I'll happily take someone out. It's my first Donny, so I'm going both days to give me plenty of time both to see the show and to meet as many of the folks as possible. I'll be only too glad to lend a hand. Next years meet could display it all proud as punch glossy and shiny...!!!!!!!! Maybe this would be the ideal opportunity to hijack the big mans car...... and do a little more fund raising!!!!!!!!! Would be good especially if we could use SW Lotus and use it as a combined stand car!!!!!!!! That's what I was hinting at whilst trying not to blow the cover. Matk is worried I may not have been subtle enough, so he may edit the original. If he does, he'll also need to edit your reply in that thread or it would look too suspicious, so don't be too surprised. Sorry Mr Mods delete away...!!!!!!!!!! Payment duly sent to help get that car back on the road..
Hope you don't mind, I have removed it. It is a good idea but prob best discussed here. Guys just a gentle reminder that as per other posts, Si is suspicious (think he feels a disturbance in the force!) and we need to be doubly careful we don't let the cat out of the bag unintentionally in other posts. I think Howard has revisited his already as I can't see anything at all in his post. Evo Magazine are happy to run a story or article about this, nice one! I wrote to Classic and Sports car, waiting to hear from them. I'll also speak to Alan at Club Lotus about his mag and maybe Remarque magazine. As far as Si is concerned I am going up there to help him out and set his cam belt and talk him through a few things. He does not know the extent of the amazing good will that you have all displayed. So if anyone blurts out anything just use that as a cover. We can do damage control if need be I can say that we managed to pick up a few things at the parts sale that we knew he needed and things like that. 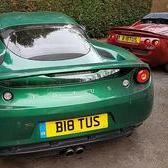 Or that Lotus have sorted a few bits out ect ect. He has a friend up this weekend from the Nissan forum so I will proberbly borrow my friends Lotus 7 armed with a crash helmet and a very thick coat) and pop up there on Monday or Tuesday. Just to say job done, hope my modest contribution can help make some small difference. Best of luck and I hope things go well. That's a cracking idea as it goes and when they are out we can sneakily steal his car, place some bricks under the tarp and he'll not know it's even gone! Ah looks like Bibs is keen on doing the LEF version of Overhaulin' then. I persume Troy will play the part of Chip Foose and the rest of the LEF guys working on the car can be the A-Team . If everyone wants to go for it shall I start another thread so we can discuss a route places to stop for food etc ....? Good work - cheque on its way! Just let us know the arrangements. I can be available any Friday with luck, just let me know what is required. When I said "Howard", I should have said "Simon" - I really should go to bed before my eyes get to the point where "simon350s" looks exactly like "esprit350". Sorry for the confusion. prehaps I shopuld change my screen name to Howard, what do you think? Back on topic: Do we have any idea yet about the timing for the hijacking? I'm just thinking we might need a short-term plan (which could also serve as a smoke-screen for the main event) in order to stop Si doing himself more harm. I get the impression that if we start with some token help on the car, he's the sort of guy who would want to "pull his own weight" when we weren't looking, which is the last thing we want. Where's Machiavelli when you need him? Hello, donation made from the Netherlands. Hope it will cheer him up a bit. OK as you may have heard my cam belt is split on my S3 so I will not be able to drive it down to Bigsi's. So instead I have nicked my friends Lotus 7 kit car that I built for him and will be flying up there in that on Monday. So if you could all keep your fingers crossed for me for some good weather it would be appreciated. I will be decked out in my finest gortex jacket and trousers and will be wearing my somewhat scruffy crash helmet to keep me a bit warmer but a liitle good weather would be great. I am basicaly gonna have a good look at it and have a little chat with him. Then I will come to the comclusion that it would be easier if I took it away and did it in my workshop. That covers us for stealing his car and emtying his concervatory of engine parts. He'll proberbly kick up a small fuss saying he wants to help, so I'll counter with something like it will keep his misses happy and make it easier for me to do the work. That will cover the theft of the vehicle and all parts he may have, Fishy and Bibs can tease him a bit because he knows that we pop round to see each other now and again, and maintain the illusion that I have it in Hertfordshire. I think if we are going to have a hoon then the delivery day is proberbly best for that way everyone will get to see his shocked face. We have had some very good offers from PNM and South West Lotus Centre to do what they can on discounts for parts. The guys at Lotus have our backs on any technical questions that may arrise and all you guys have made this all posible with your kind contrabutions.